It makes a big difference in your strategy if you are playing against one or three other players. Since, arguably, a two player game tends to be more cut throat, I will write this Ingenious board game guide from that perspective. The most overlooked fact that most new people forget: The winner is the person with the highest points for their weakest color. You can max out five of the colors, but if your sixth color is at 1 or 2, you are going to lose. 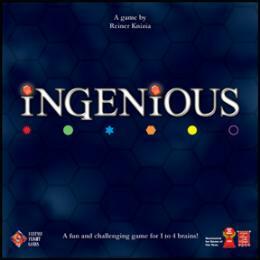 Like most games there are three strategic stages to Ingenious. Try to piggy back on your opponent’s development. For example, if they put a double color on the starting color spot, they get two points. If you add on to it with another double piece, you can get four. The second person gets more points for the same movement. Try to make moves that will gain the most points in any color combination. Try to get most colors over the 10 mark. If you have two moves that will net you the same points pick the one that includes your weaker colors. You will start to shift from making the moves that net you the most points to the ones that increase your weaker colors. Also start pay attention to your opponents score and identifying their weak color. Don’t use your Ingenious moves just yet. Save them for the endgame. The board is getting crowded and some colors are about to be closed off. You want to choke off access to your opponent’s weakest color by blocking. This is where you can use your Ingenious moves to slam down two pieces while at the same time getting rid of unneeded pieces. Remember, to keep your weakest color higher then your opponent’s. Near the end, even one or two points can be huge. Don’t go all algorithmic and only try to increase your currently weakest color. This will guarantee that all your colors will be weak. Take advantage of flushing your hand with it present itself. If your weakest color gets blocked, you can start it again by “floating” a piece far from the other pieces so that your opponent can’t shut it down. Do this only when you have to since it costs you a turn where you don’t score. Enjoy this pretty game of colors!